Nestled on 35 acres in rural Niagara County, the Barnabite Fathers’ Basilica of the National Shrine of Our Lady of Fatima is a destination for pilgrims, art enthusiasts, and tourists of all kinds. But the Italian-run basilica dedicated to a Portuguese miracle only exists because of a Polish-born laborer. Walter Ciurczak was born in Poland in 1893. While he was still a child, Walter and his family immigrated to America and by 1903 settled in Niagara Falls. By age 25, he was married to Helen Polewicz and after having a few different jobs began working at Dobbie Foundry and Machine Co. In that time Walter purchased a couple dozen acres that would have been William Love’s Model City. As his life progressed with his wife and children, Ciurczak suffered a stroke. On what he believed to be his death bed, Walter prayed fervently to Our Lady of Fatima for a miracle to get better. Ciurczak began to get better and by 1953 was fully recovered. When Father Andreani came knocking, Walter saw his opportunity to thank the Holy Mother by stipulating that after purchase, Reverend Andreani must erect a small shrine on the property to her. When word of Ciurczak’s generous gift got around, more people began donating for the shrine and money began to pour in. Soon the construction of the shrine took precedence over the seminary. By the spring of 1956, the shrine which began with two simple statues, grew in to a half-million dollar project. Father Andreani brought on famed Polish American architect Joseph E. Fronczak, who came up with the layout for the outside shrine. Designed in the form of a cross surrounded by cypress trees, there would be an avenue of saints, a Shrine to Our Lady, one to St Ann, one to St. Mother Cabrini and finally altars with a large pool in the shape of a rosary. 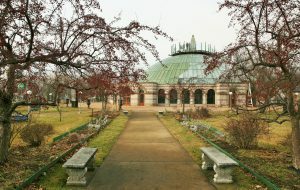 From Fronczak’s initial design, the shrine blossomed to include a glass-domed worship site, a number of grottos and shrines including one to Our Lady of Czestochowa, a cafeteria, and a seminary. In 1975, Pope Paul VI declared the site a basilica. Around the time the shrine was becoming a basilica, Professor Joseph Slawinski was hired to create a sgraffito altar piece for the domed building. The Peace Mural he crafted depicts two outcomes for humanity. On the left is a world ravaged by war, surrounded by death, and consumed by conflict. On the right is one when the arts, sciences, education, and exploration are celebrated. In the center is the Holy Spirit looking down on a pregnant woman, flanked by the four races of the world. Her pregnancy is the representation of the peace that is not yet here, but ever possible. Keeping in touch with its Polish roots the shrine Polish Day every July that includes a special crowning of Our Lady of Czestochowa. "2,000 Worshipers Attend Ceremonies At Lewiston Shrine." Niagara Falls Gazette [Niagara Falls, NY] 16 Aug. 1959: 1-C Print. "$250,000 Drive Slated For Seminary, Home." Niagara Falls Gazette [Niagara Falls, NY] 10 Nov. 1957: 8-C. Print. 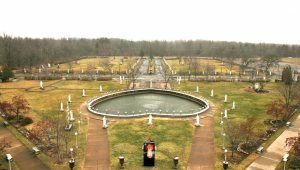 "$500,000 Outdoor Catholic Shrine Started in Lewiston." Niagara Falls Gazette [Niagara Falls, NY] 18 Apr. 1956: 36. Print. "Anniversary To Be Marked." Niagara Falls Gazette [Niagara Falls, NY] 27 Aug. 1966: 2. Print. "Barnabite Fathers Launch $150,000 Building Drive." Niagara Falls Gazette [Niagara Falls, NY] 11 May 1955: 39. Print. "Barnabite Pioneer Dies at 71." Niagara Falls Gazette [Niagara Falls, NY] 22 Dec. 1962: 7. Print. "Catholic Order Buys More Land." Niagara Falls Gazette [Niagara Falls, NY] 14 Apr. 1955: 16. Print. "First Building At Shrine to Be Blessed." Niagara Falls Gazette [Niagara Falls, NY] 26 Jan. 1957: 13. Print. "Formal Dedication Saturday, June 19, at 4 P.M. - The New Our Lady of Fatima Shrine Chapel." Niagara Falls Gazette [Niagara Falls, NY] 17 June 1965: 26-27. Print. Glynn, Don. "An Inter-faith Retreat House Dream of Fatima's Directors." Niagara Falls Gazette [Niagara Falls, NY] 2 May 1971: 4-C. Print. "Ground Broken for Seminary." Niagara Falls Gazette [Niagara Falls, NY] 9 Nov. 1959: 14. Print. Nelson, Bill. "Swan Road Shrine Produces Miracle Of Modern Faith." Niagara Falls Gazette [Niagara Falls, NY] 10 Nov. 1957: 8-C. Print. "Our Lady of Fatima Shrine." Buffalo Courier-Express [Buffalo, NY] 27 Aug. 1966: 13. Print. Our Lady of Fatima Shrine Lewiston, New York. Lewiston, NY: Barnabite Fathers, 2012. Print. Peace Mural. Lewiston, NY: National Shrine Basilica of Our Lady of Fatima, 2008. Print. Peace Mural. Lewiston, NY: National Shrine Basilica of Our Lady of Fatima, 2011. Print. "Prayer Answer Brings Gift of Shrine Land." Union-Sun & Journal [Lockport, NY] 12 Apr. 1960: 7. Print. "Shrine Benefactor, Falls Resident, Dies." Niagara Falls Gazette [Niagara Falls, NY] 8 Dec. 1964: 17. Print. "Shrine Will Observe 10th Anniversary." Union-Sun & Journal [Lockport, NY] 9 Sept. 1966: 4. Print. "Tentative Shrine Setup Includes Only 2 Statues." Niagara Falls Gazette [Niagara Falls, NY] 14 Sept. 1956: 17. Print. "Towering Statue Will Be Placed On Hill at Shrine." Niagara Falls Gazette [Niagara Falls, NY] 11 June 1956: 3. Print. "Work to Start At Barnabite Seminary Site." Niagara Falls Gazette [Niagara Falls, NY] 5 Nov. 1959: 20. Print.